Since he was very young, 20-year-old Luis Fernando Cruz was fascinated by the idea of becoming an inventor. He wanted to improve society through his creations. His determination to help society was heightened by the fact that he was born and raised in Honduras. Hoping to be able to study at a university in the United States, Luis Fernando moved to Colorado to finish his senior year of high-school with the financial support of his parents. His perspective on how to use technology changed dramatically, when he met a fellow student, who was paraplegic. He realized that advanced technology allowing people like his classmate to overcome communication problems was not available for millions of people suffering around the world, because it was too expensive. He became determined to provide affordable solutions for people with disabilities across the world. 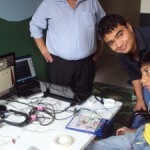 After months of research and testing, Luis created the Eyeboard, an inexpensive, but reliable human computer interface that detects eye movements using electrooculography (EOG), a biomedical technique based on picking up signals from electrodes placed around the eyes. The interface enables users, who cannot manipulate a mouse with their hands, to move a cursor on the computer screen. 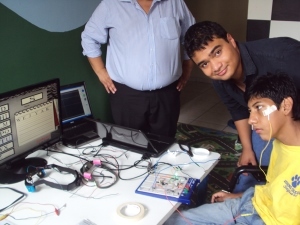 Luis Fernando’s prototype of the monitoring bioelectrical signals costs less than $300, while other similar biomedical systems are available for a minimum of $10,000. In order to make his technology accessible to people around the world, Luis Fernando created an online tutorial for replicating his technology and published this along with the schematics and coding details, which can currently be downloaded at no charge. A more advanced do-it-yourself kit can be purchased through Intelsath for $150. Luis Fernando has also developed a Morse decoders that interprets and translates sounds into words, a software program to convert Fahrenheit to Celsius, which can also be purchased through Intelsath. For his incredible work, in 2012, Youth Service America chose the young Honduran entrepreneurs as one of ’25 most influential young people in the world.’ His Eyeboard was also selected by The History Channel as one of the five top teen inventions in recent years. Luis Fernando is currently a student in electrical engineering at the University of New Orleans in the U.S., but he aspires to return to his hometown, La Ceiba, a Caribbean port city, situated north of Tegucigalpa, and start a technology company. While Luis Fernando may already be a successful entrepreneur, his parents are still struggling to pay half of his education costs with the help of small donations from online supporters. Despite these struggles, he continues to define himself as an entrepreneur in philanthropy, which he understands to mean putting his innovation skills to work on behalf of humanity and make this a better world.